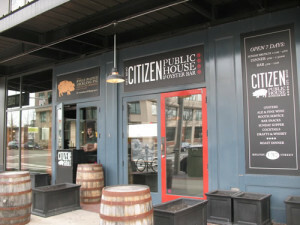 Citizen Public and Oyster Bar is a Restaurant Establishment on Boylston St. in the Fenway area of Boston. It is a great location owned by Dave Dubois and his Partners. We have had a long standing relationship with Dave, for over 20 years, selling him lighting for his many Business Ventures as well as selling fixtures for him that came out of his many ventures. For Dave, Antique Lighting has always been a sort of a “texture” he can add to a “Palette” he uses to create different environments in his Restaurants. Dave came to me about 6 months ago wanting to add a fixture over the Citizen Public House & Oyster Bar in the Restaurant. When they opened almost seven years ago they had installed a Mid Century Light that they were thinking of replacing. 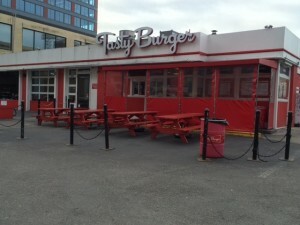 Across Boylston St. is another one of his Restaurants, Tasty Burger with a much more relaxed flavor. The two Restaurants opened around the same time and we had sold Dave a set of much more relaxed Mid-century Pendants for this environment in which they sell mostly Hamburgers. Compared to Tasty Burger, Citizen Public House has a much more upscale feel. In one Corner of the Citizen Public House & Oyster Bar Restaurant was a Very Large Bronze Lantern we had sold him upon opening. It was doing its job by creating an strong Architectural feel to the environment of the Restaurant. It was nestled over some booths and the size of the fixture and the amber seeded glass we had, finished the fixture which created a positive element in the large room. This most recent task was to come up with something that he could put over the Oyster Bar that worked with the many existing elements in the room and keep it going in the decorative direction Dave wanted. I had talked to him a number of times before he came in to actually look at our Inventory of possibilities. In the back of my mind I thought he needed a decorative element but this more Architectural flavor might be enhanced by a large semi-architectural Inverted Dome. After showing Dave about 8 Inverted Domes and narrowing it down to five I took them over to Citizen Public and stood on the Bar and held them all in place with the aid of a hand held Dimmer to give him and his Partners a good idea of how the fixture would look. The unanimous decision was a Bradley and Hubbard Turn-of-the-century Bronze clad 24-inch diameter Inverted Dome. It added this Architectural flavor with a somewhat decorative element brought in by the Cameo effect of the filigreed overlay that the translucent Slag glass shone through. I have often talked about the more minimal current decorative trend in the country and these very resilient Inverted Domes seem to satisfy this need many times when the use of Antique Lighting is in effect. The fixtures often have a more Architectural feel than other fixtures that work with the more decorative elements in rooms. Many of our Customers are using contemporary furniture in these period environments. In trying to add something reminiscent of the period, they can use an Inverted Dome, which is a little more of an Architectural element that fights less with their design choices.